Inniskillings return to the field force, South Africa. John Sherwood Kelly was born in the Eastern Cape Province, South Africa on 13 January 1880 and served from the age of 16 in various corps in the Matabele War, Boer War, Somaliland Campaign, Zulu Bambatha Rebellion, First World War (Gallipoli and Western front), and briefly in the invasion of North Russia. When he returned from Russia and wrote letters published by the Express newspapers in September-October 1919, the Army prosecuted him for a breach of King's Regulations. Although his letters openly opposed the war against the Bolsheviks it was decided that the substance of the charges against him would be confined to communicating his opinions to the press 'without special authority'. He was found guilty at his court martial on 28 October 1919, was awarded a Severe Reprimand, and retired several weeks later with the honorary rank of Lieutenant Colonel. He died aged 51 on 13 August 1931 and is buried in Brookwood Cemetery, London. 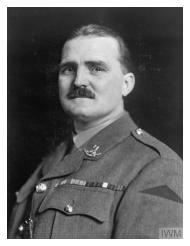 His Victoria Cross is in the collection of the National Museum of Military History in Johannesburg, South Africa. C.M.G., D.S.O., Norf. R., comd. a Bn., R.
high ground held by the enemy. them to capture the position.